We got to attend an early screening of The Incredibles 2. I remember taking my son (who is 14 yrs old) to The Incredibles way back when he was a tiny baby. I spent most of the movie nursing him. To say we were thrilled to see The Incredibles 2 is a total understatement. I think The Incredibles is one of our favorite movies as a family. 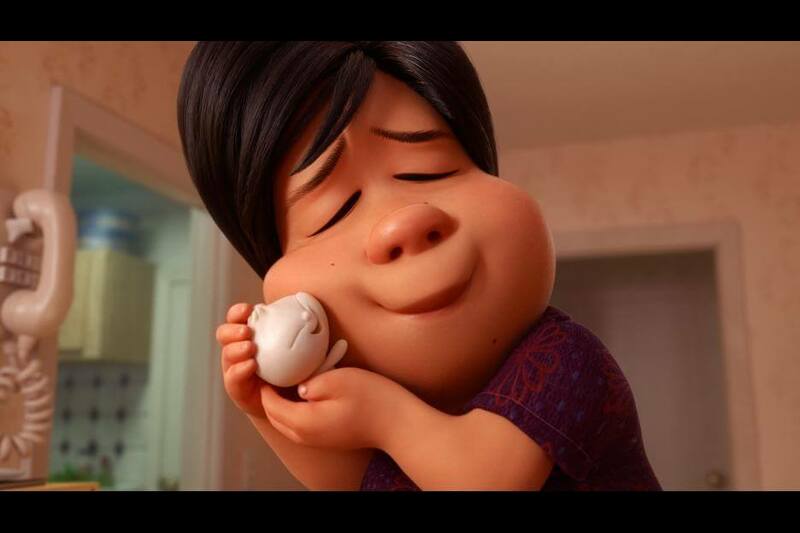 A Pixar short film came before the movie, Bao, and it was adorable. It was about a helicopter mom who is dealing with her little dumpling “son’ growing up. I definitely could relate with my oldest going off to college. I think most of the message went over younger kids heads. It was sweet, but it was also hilarious and everyone was laughing out loud. If you recently watched the first movie, then you’ll love that The Incredibles 2 begins exactly where that one left off with the family walking out of Dash’s track meet and into the destruction from The Underminer. Soon there’s a campaign to bring back supers, and we get to meet a few new ones, but favorite characters like Frozone and Edna are back. Plus, we get to see Jack Jack’s new powers! He’s a crazy one who definitely reminded me of my 13 month old. She just might be a Jack Jack in the making. I don’t want to reveal too much, so you can enjoy it. But, I do love the family dynamic of The Incredibles movies, and they definitely have a lot of laughs in this one. My kids still can’t quit talking about Jack Jack. He definitely stole the show. My only complaint is you can figure out who the new villain is very quickly into the movie. I would have loved it to be a bit of a shocker. I will tell you that my 8 yr old is very sensitive and does scare easily, so she was scared through some of the action parts of the film. But, she also said she loved the movie and her favorite parts were with Jack Jack. 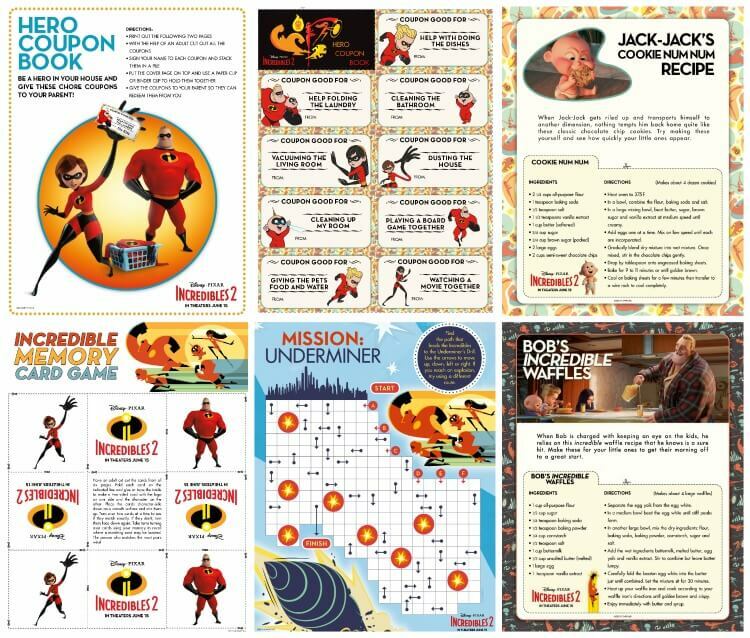 Scroll down to the bottom of the post for some fun The Incredibles 2 activity sheets! But first, let’s make some Incredibles Cinnamon Rolls! To start with we need to make some Incredibles Sprinkle Mix, which is 1 pouch each of Yellow, Orange, Red and Black sprinkle jimmies as well as the same in non-pareils. You’ll have a total of 8 pouches all together. Combine all sprinkles into a closed container and shake until combined. These Incredibles 2 cinnamon rolls are fairly easy and start with a box cake mix! Once combined, place dough onto a floured surface and knead until combined and the dough bounces back after touching it. 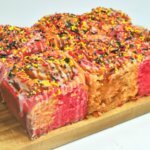 Split dough into two halves and add red gel food coloring to one dough. Knead it until the color is equal throughout. Next, add the orange gel coloring into the second dough half and knead it the same. Place both dough balls into their own large glass bowl and brush the 1 tbsp oil onto the top of the dough as well as the sides of the glass bowl. Cover each bowl with a kitchen towel and let sit for an hour. 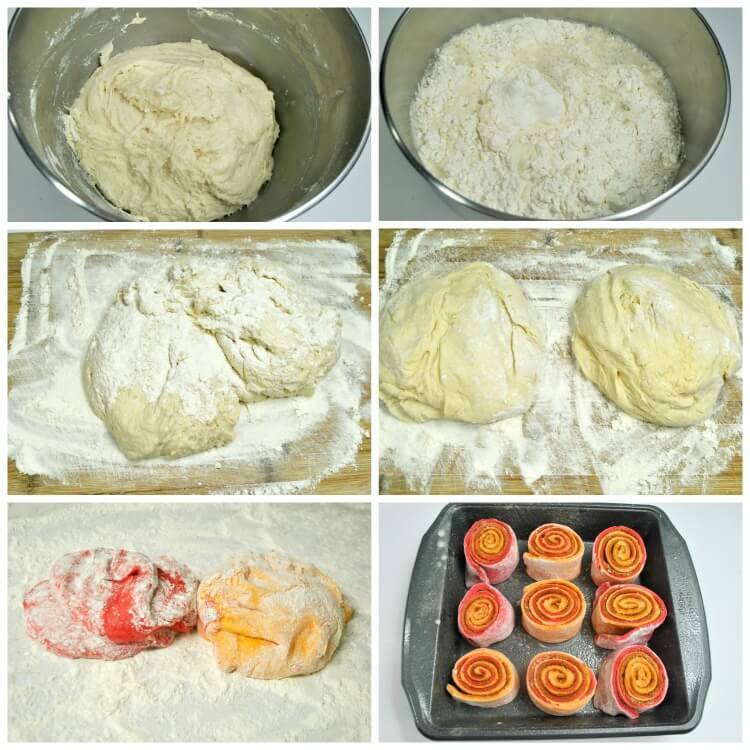 Once the dough has doubled in size, combine both doughs gently together then place it onto a well floured surface and roll it out to 1/8 inch. This will give it a marbled effect. Brush melted butter onto the dough and sprinkle with the cinnamon and sugar. Roll into a log and cut into rolls. At the end of that hour, preheat the oven to 350 degrees. Bake the cinnamon rolls for 30 minutes. Using an electric mixer, combine the powdered sugar, vanilla and whole milk together until smooth and creamy. Once the cinnamon rolls have been baked, remove from oven and drizzle the icing onto the cinnamon rolls. 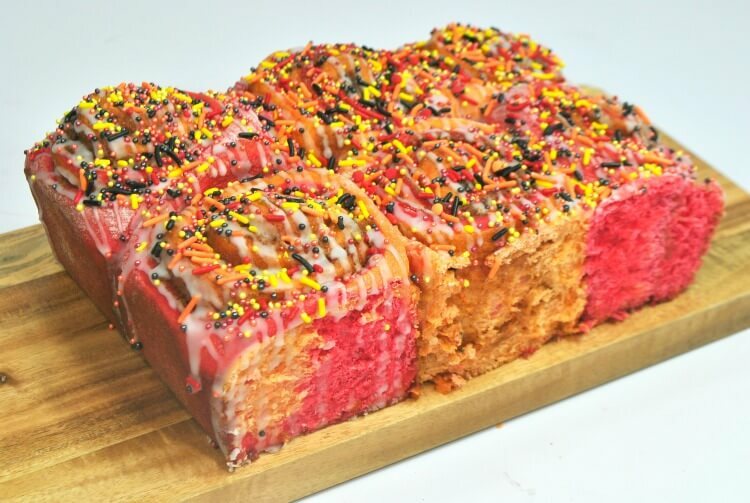 Sprinkle some of the incredible sprinkles onto the rolls. Allow cinnamon rolls to cool for about 15 minutes before enjoying. Click the image below to print these fun activity sheets for the new movie! 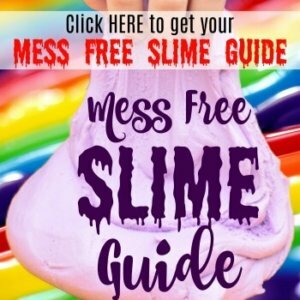 There’s a memory game, some recipes, and even a coupon book!